The Bosch Therm Horizontal Vent Kit (AQ5EFPLUS) is a side wall vent kit, a set of WebStone Isolation Valves and an 18" GFCI for use with the Bosch Therm 660EF tankless water heaters. The AQ5EFPLUS Vent Kit is required for all side wall installations. This kit includes all of the stainless steel venting parts that will be needed if the Bosch 660EF tankless water heater is installed on the same wall through which the exhaust will vent. Included in this kit are a 90 degree elbow, a 12" length of pipe, an 18" length of pipe, a wall thimble, a termination box, a Bosch 660EF Adaptor, a 3oz tube of high temperature silicone sealant, a set of WebStone 44443WPR lead-free isolation valves for hot and cold water and an 18" auto-reset Ground Fault Circuit Interrupter (GFCI). All parts are 3" diameter Z-Vent venting manufactured by Z-Flex. 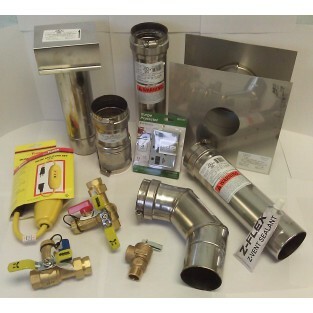 Additional 3" Z-Flex Z-Vent stainless steel vent parts are available on this web site.